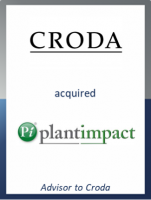 Steve Foots, Group Chief Executive of Croda, said: "I'm delighted to be announcing Croda Europe’s acquisition of Plant Impact. This is high-quality, novel technology that further expands our position in the crop care sector and supports our strategy of investing in high-growth markets and world-leading technologies. Plant Impact has assembled a great team, and we’re really excited to work with them to accelerate development of this business." Phil Adams, CEO of GCA Altium, commented: "It was a pleasure to work with Croda and the legal team at EY on this transaction. The process required us collectively to work at a very high pace and we are delighted to have achieved a successful outcome."